Art Amos of Buncombe Street, Edgefield, had been hearing something around his house at night and he decided he should catch the intruder before it got into his daughter’s (Lizzie Kornaus) chickens, next door. He thought probably it was a raccoon and set a trap. Now, Art grew up on Long Island, but because that is New York State, it doesn’t mean he doesn’t know about wildlife predators. He was an outdoor guy growing up. To catch the suspect, he put chicken into the trap, and after a couple of nights of no catch he decided to go fishing and put a fish in the trap. He got it good and smelly (probably the human scent on the chicken had deterred the suspect animal, says one wildlife person) and then it bit! And what did he have in his trap? A fox! Is he red or gray? Many may know that red foxes are not as plentiful as the grey, at least around here. They have been subject to the appetite of the coyotes, according to folks who know about these things. If this is a red fox, it was possibly in what is a molting phase as there were patches of grayish brown fur on his back, the fur much longer than the short red fur around his face and neck and flanks. As for the tail, it had red, gray and white marking it. 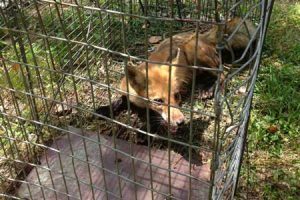 Mr. Fox was pretty unhappy about being caught, and it was not long before the Animal Catcher, Deputy Lizzie Kornaus (also Amos’s daughter, as we said) of the Sheriff’s Office, took the trapped animal and let him loose in the wild. We are sure the chickens were grateful. After inspecting our photos, those who have some expertise in these matters may wish to write us of their thoughts about this fox – red or gray? That’s indeed an adult red fox that is changing to cooler clothes for summer. This fall it will have a uniform red coat, and its feet and forelegs will be black, its ears trimmed in black, and the final touches will be a white throat and chest and its definitive white-tipped tail.